A new edition to a Benton Collection bathroom vanity selection, the beautiful Kerianne bathroom vanity has arrived! 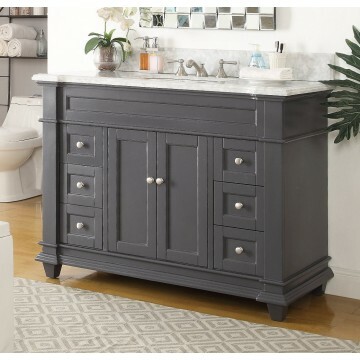 This 48” single sink vanity will be the keystone of your master bath. The strong, authentic design commands attention and speaks volumes about your elegant taste. The exceptional detailing and solid marble countertop are hand done. Vanity cabinet is all wood construction. White undermount ceramic basin: countertop opening: 11" x 16.25"